In a recently published article, J. D. Allan et. al. 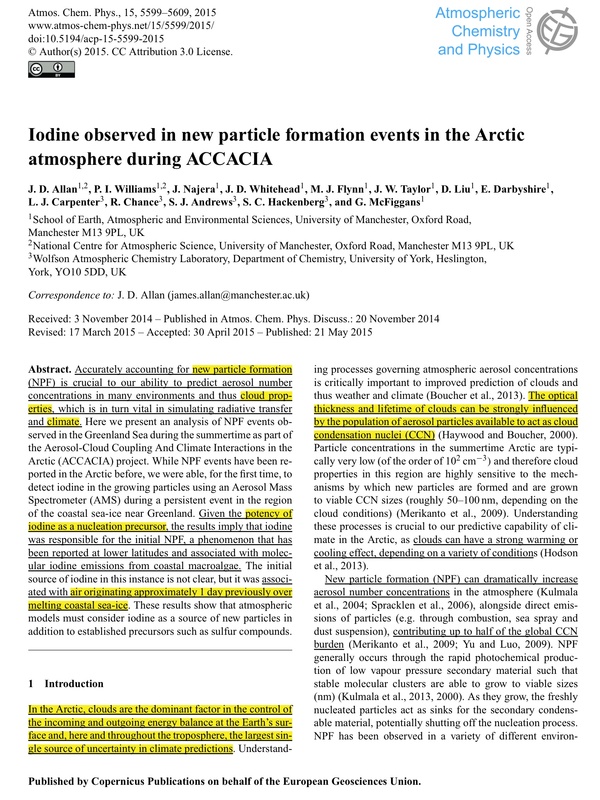 (2015) discuss the role that iodine has in cloud formation, and thus climate change. While radioactive iodine is not specifically mentioned, it would have the same chemical effects, combined with additional radiological effects (e.g. radiolysis; heat). The long-lived (half life 15.7 million years) radioactive iodine 129 is present, in ever-increasing quantities, in the Arctic. Radioactive iodine 129 and 131 are emitted from routine operations of nuclear reactors, accidents such as Fukushima, and historically from nuclear weapons (testing). 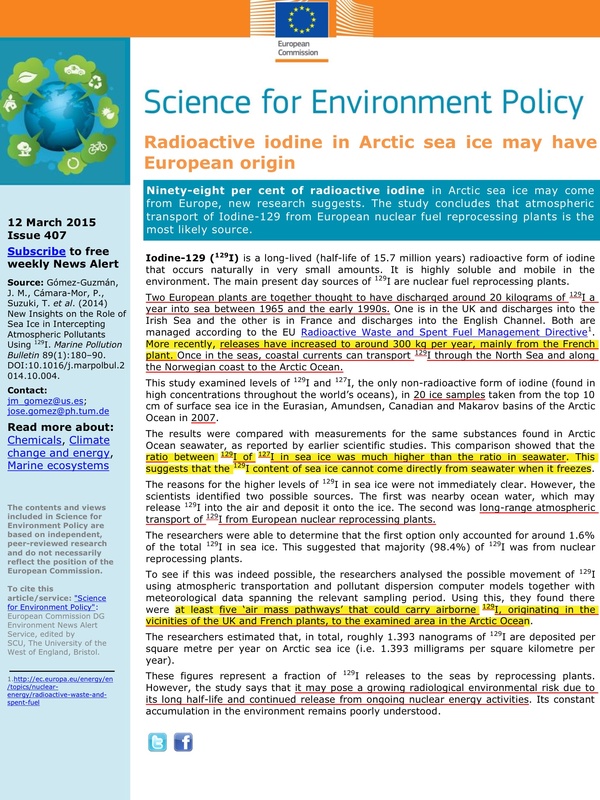 Iodine 129 is also present in spent nuclear fuel and the nuclear fuel “reprocessing” facilities at Sellafield (UK) and La Hague (France) spew several hundred kilograms (2.2 lbs) of radioactive iodine 129 into the environment each year, about half of which ends up in the Arctic. Gómez-Guzmán et. al. 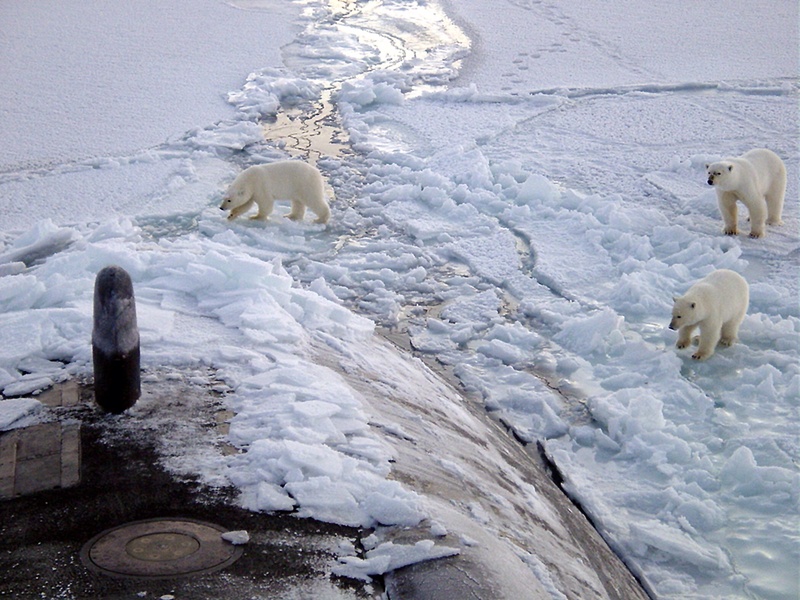 (2014) found higher levels of radioactive iodine 129 in sea ice, than in sea water. This suggests the mysterious source of the iodine. 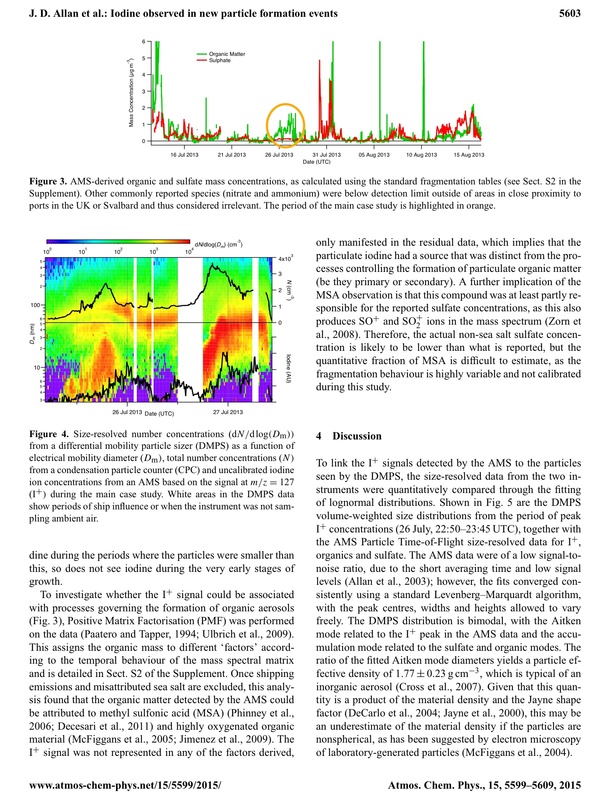 “Atkinson et al. 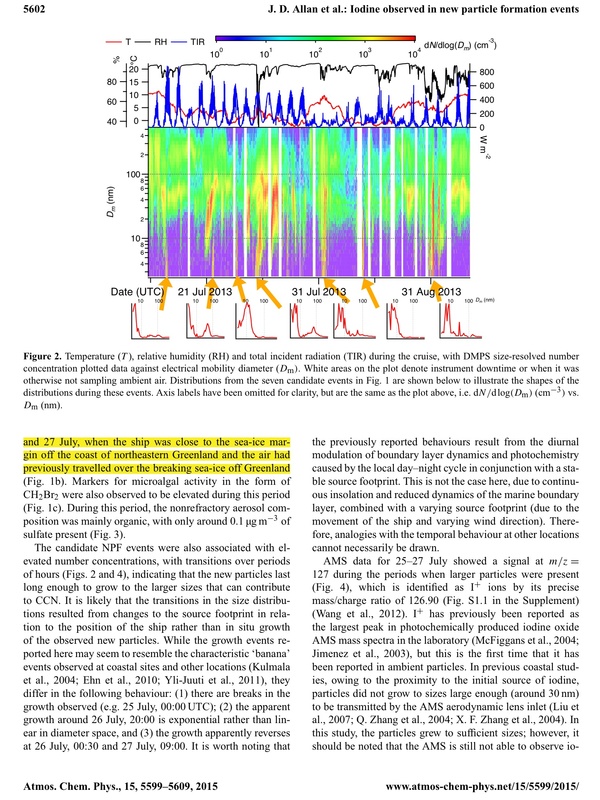 (2012) attributed NPF events observed in the Weddell Sea in Antarctica to iodine emissions from sea-ice.” (Allan et. al.) Atkinson et. al. also considered the origin of the iodine a mystery. 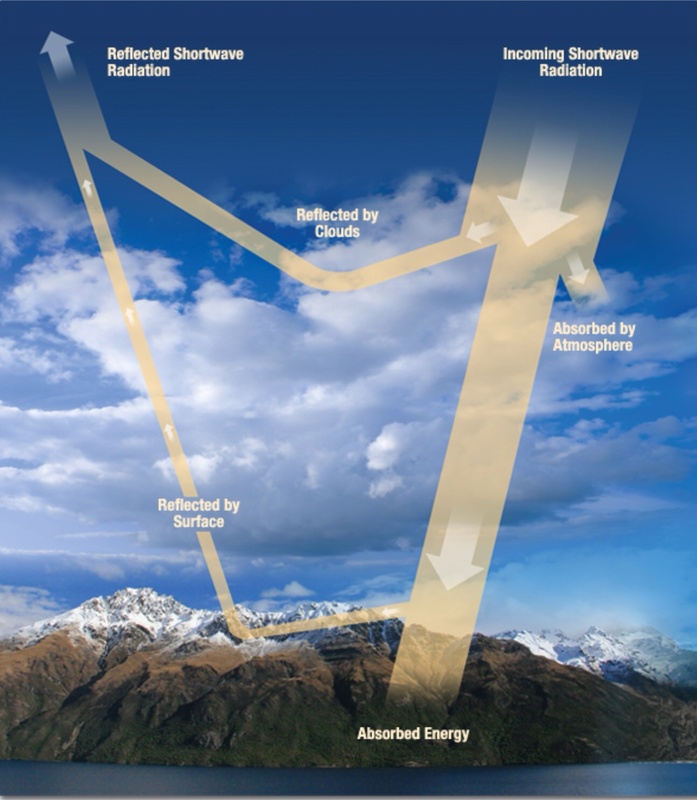 The solar radiation that passes through Earth’s atmosphere is either reflected off snow, ice, or other surfaces or is absorbed by the Earth’s surface. “Iodine-129 (129I) is a long-lived (half-life of 15.7 million years) radioactive form of iodine… It is highly soluble and mobile in the environment. The main present day sources of 129I are nuclear fuel reprocessing plants./ Two European plants are together thought to have discharged around 20 kilograms of 129I a year into sea between 1965 and the early 1990s…. More recently, releases have increased to around 300 kg per year, mainly from the French plant. Once in the seas, coastal currents can transport 129I through the North Sea and along the Norwegian coast to the Arctic Ocean./… The reasons for the higher levels of 129I in sea ice were not immediately clear. However, the scientists identified two possible sources. The first was nearby ocean water, which may release 129I into the air and deposit it onto the ice. The second was long-range atmospheric transport of 129I from European nuclear reprocessing plants…. 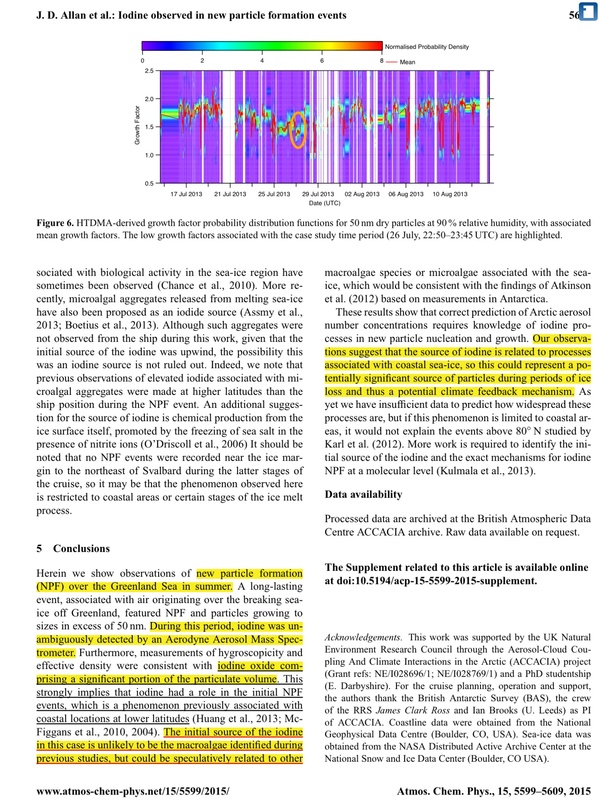 they found there were at least five ‘air mass pathways’ that could carry airborne 129I, originating in the vicinities of the UK and French plants, to the examined area in the Arctic Ocean… a growing radiological environmental risk due to its long half-life and continued release from ongoing nuclear energy activities.” (See more of the EC review “Radioactive iodine in Arctic sea ice may have European origin” of the Gómez-Guzmán et. al. 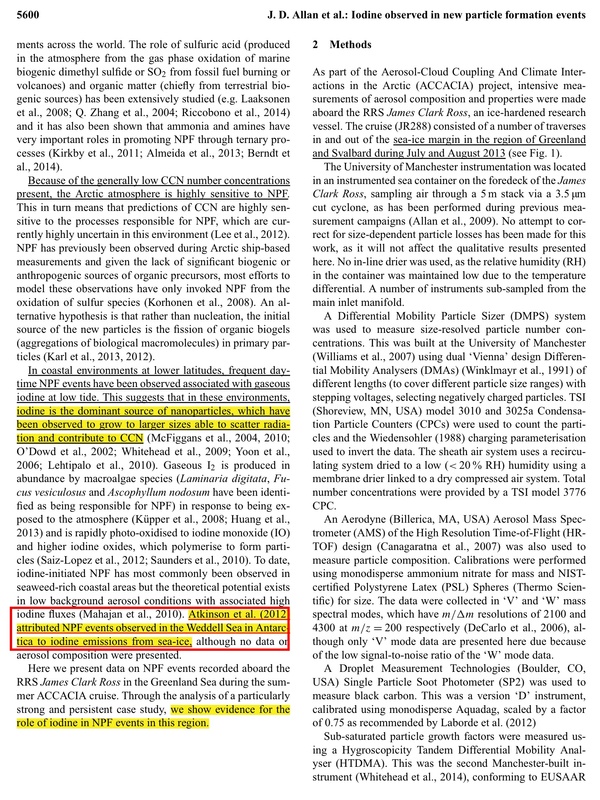 article (2014) after the Allan et. al. article. 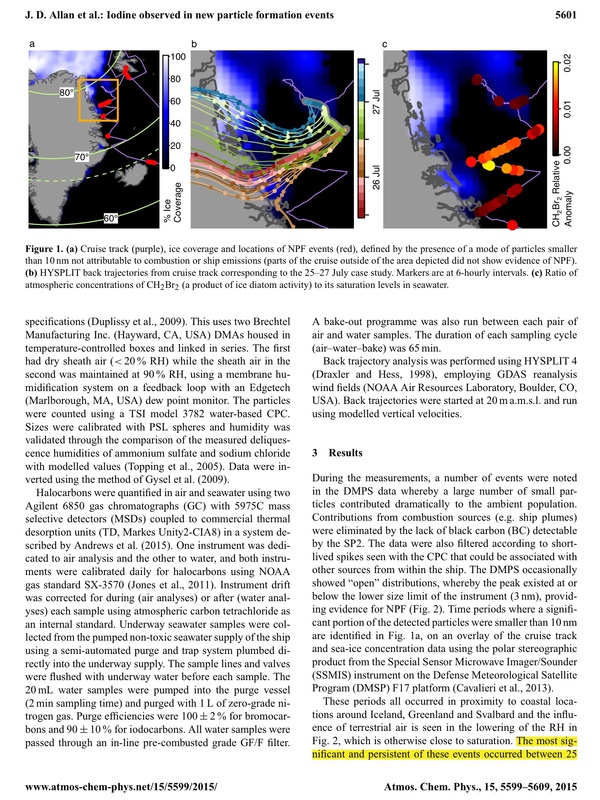 “New insights on the role of sea ice in intercepting atmospheric pollutants using (129)I.” Mar Pollut Bull. 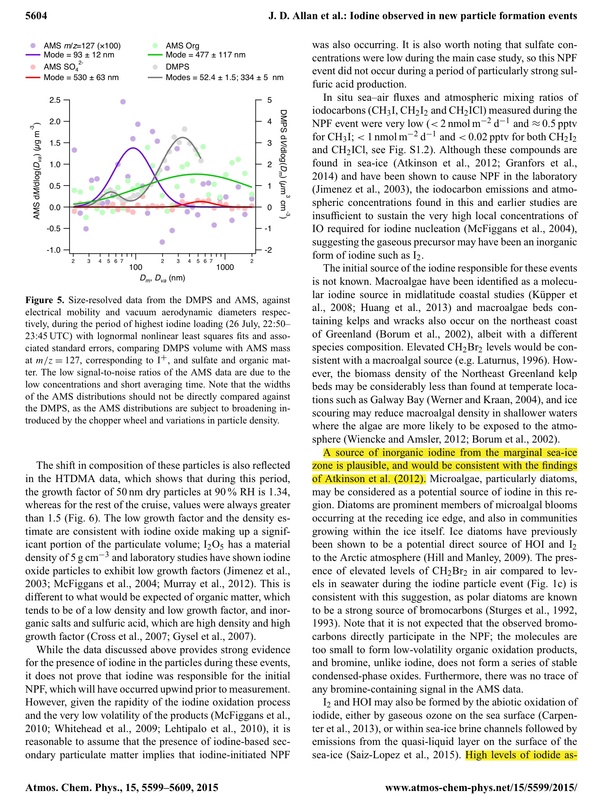 2014 Dec 15;89(1-2):180-90. doi: 10.1016/j.marpolbul.2014.10.004. Epub 2014 Oct 23. Gómez-Guzmán JM1, Cámara-Mor P2, Suzuki T3, López-Gutiérrez JM4, Mas JL5, Masqué P6, Moran SB7, Smith JN8.